Magnetic hyperthermia is an oncological therapy where magnetic nanostructures, under a radiofrequency field, act as heat transducers increasing tumour temperature and killing cancerous cells. Nanostructure heating efficiency depends both on the field conditions and on the nanostructure properties and mobility inside the tumour. Such nanostructures are often incorrectly bench-marketed in the colloidal state and using field settings far off from the recommended therapeutic values. Here, we prepared nanoclusters composed of iron oxide magnetite nanoparticles crystallographically aligned and their specific absorption rate (SAR) values were calorimetrically determined in physiological fluids, agarose-gel-phantoms and ex vivo tumours extracted from mice challenged with B16-F0 melanoma cells. 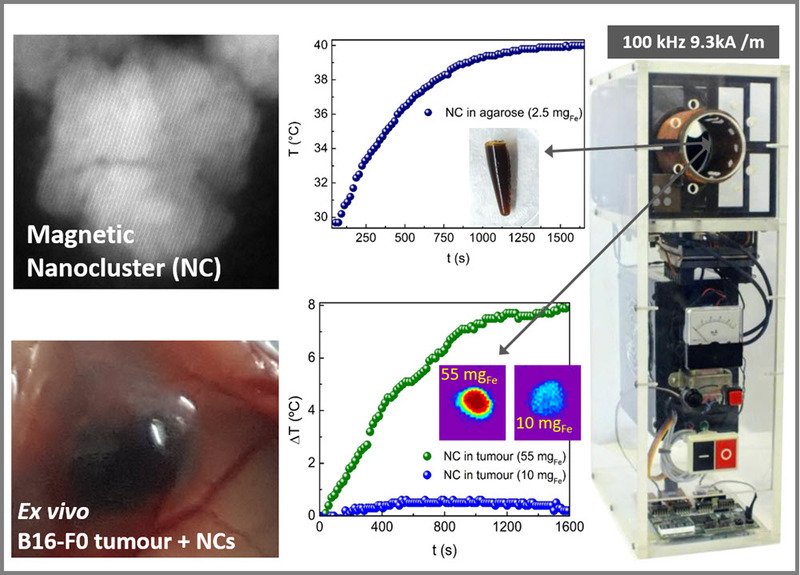 A portable, multipurpose applicator using medical field settings; 100 kHz and 9.3 kA m−1, was developed and the results were fully analysed in terms of nanoclusters’ structural and magnetic properties. A careful evaluation of the nanoclusters’ heating capacity in the three milieus clearly indicates that the SAR values of fluid suspensions or agarose-gel-phantoms are not adequate to predict the real tissue temperature increase or the dosage needed to heat a tumour. Our results show that besides nanostructure mobility, perfusion and local thermoregulation, the nanostructure distribution inside the tumour plays a key role in effective heating. A suppression of the magnetic material effective heating efficiency appears in tumour tissue. In fact, dosage had to be increased considerably, from the SAR values predicted from fluid or agarose, to achieve the desired temperature increase. These results represent an important contribution towards the design of more efficient nanostructures and towards the clinical translation of hyperthermia.